On this date in 1818, Andrew Jackson had two Creek leaders summarily hanged in Florida. The Creek in the American Southeast were a longtime thorn in the side of the young United States, and Andrew Jackson personally; Old Hickory was one of the chief American commanders in the Creek War several years before, a sort of subplot of the War of 1812 with Creek throughout the Gulf Coast aligning themselves with the British against American colonists. One source of inspiration: the mighty Tecumseh, who assembled an ambitious native Confederacy to check Europeans’ advance. Although centered in the Great Lakes area, Tecumseh’s defeated vision was very broad, and he made a diplomatic visit to the American South seeking to bring the major tribes of that region into his alliance. Some Creeks saw a lot to like about Tecumseh’s line; they would become known as Red Sticks, for they raised the symbolic “red stick of war” against the whites, and announced it by massacring the entire population (about 500 souls) of Fort Mims, in Alabama. Further south, in Florida, the Creek prophet Josiah Francis* was likewise stirred by Tecumseh; two days after Fort Mims, he led an attack on Fort Sinquefield that saw a dozen women and children killed and scalped. General Jackson suppressed that rising, forcing upon the Creek a victor’s peace that pushed that nation off 23 million acres in an L-shaped swath comprising much of Alabama and southern Georgia. ** Jackson earned his nickname “Old Hickory” in this campaign, by conquering the Creek Hickory Ground. As the clinching maneuver of this conflict — an act that would ultimately force Spain to cede Florida to the United States — the future U.S. president grossly exceeded the authority granted him by Washington to up and invade the Florida Panhandle with 3,000 men. They arrived at Fort St. Mark’s on April 6, there capturing two British subjects whom Jackson designated for an illegal court martial that would eventually hang them. But even this much due process was more than Creeks could expect. 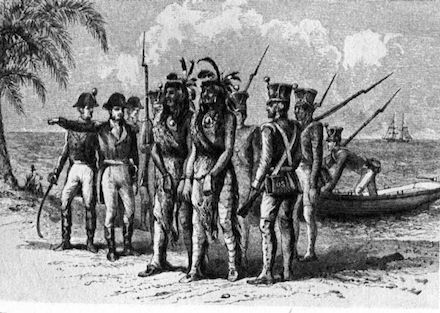 An 1818 print depicts the captured natives. * As he was known to whites. Hillis Hadjo (“crazy-brave medicine”) was his Creek name. ** And freeing Jackson to pivot to the defense of New Orleans. † During this war, Josiah Francis’s daughter, Milly Francis, became famous throughout the continent as the “Creek Pocahontas” — literally doing what Pocahontas had done, talking her people off executing a captured white man named Duncan McCrimmon. Francis declined McCrimmon’s grateful offer of marriage, but let it not be said that an American soldier does not know how to return a boon: it was McCrimmon who set up the pivotal events of this post by tipping General Jackson to the presence somewhere nearby of his benefactress’s father. Milly presumably witnessed her father’s execution; she wound up deported to Oklahoma like much of the region’s Native American populace.